Let Canva help you design personalized water bottle labels for a great first impression at any event. If you’re going to supply bottled water at your next event, why not add a special touch with a custom designed water bottle label? Whether you’re hosting a wedding, baby shower, engagement party, or birthday, custom water bottle labels can add that special hint of detail. They’re even perfect for conferences, seminars, sporting matches and charity events! With Canva, you can customize your label as little or as much as you like with fonts, images and elements that suit the occasion. In minutes you can have an eye-catching water bottle label that makes your event, brand or message something to remember. Create a new Canva account to get started with your own Water Bottle Label designs. 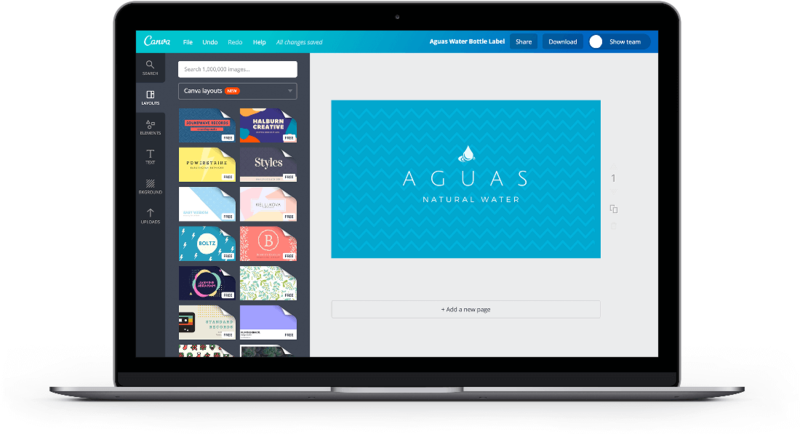 If the thought of designing your own water bottle label turns you into a ball of anxiety, it really doesn’t need to, because with Canva, graphic design is effortless, empowering and easy. We’ve got your back. Canva’s easy-to-use platform takes the guesswork out of graphic design. With Canva, good design becomes accessible and easy, so beautiful graphics and imagery are right at your fingertips. You can create your own custom water bottle label with a few simple drags, drops and crops. And with Canva’s huge selection of design elements, you’ll be able to represent your brand, personality or event accordingly. Whatever your water bottle label is for, you’ll be able to create something memorable. Amp up the fun factor by creating multiple water bottle labels for the same event. Hosting a baby shower? Create water bottle labels in pink and blue. Selling water bottles at a sporting match? Create two different labels for opposing teams so attendees not only want to buy your bottled water, but are able to make a statement with it too. You can do this with Canva and save a bucketload of time. Simply duplicate your design to create multiple water bottle labels. Once you’ve done this, you’ll only need to change the smallest details to have two designs or more in a matter of minutes. We’re sure your water bottle label will look amazing, but if you’re not sure about your design you can always share it with your friends or colleagues to get their feedback. And if you’re all about team spirit you can even select an option that gives them the ability to edit your design. How cool is that? Collaborating with Canva is super easy! You don’t have to send your design via email to get the feedback you need; you can simply share it with your contacts with a Canva link. Feeling social? Tweet your design or share it on Facebook. With sharing being this easy, you’ll have a nifty water bottle label design in no time. How much does it cost to create a water bottle label in Canva? Designing Water Bottle Labels in Canva is free! Our library of card layouts have been created by awesome designers, making it as simple for you as a few clicks to create a professional design. If you use your own images in your design, the entire process will be free. How can I add branding to my water bottle label? If you’re creating water bottle labels for an event, then make sure your design is properly branded and recognizable by uploading your logo, using your brand color palette and consistent fonts. To upload your logo, click on the Uploads tab in your object panel, select the Uploads folder, and click on the green Upload your own images button. Select any PNG, JPEG or SVG file you wish to upload from your computer.